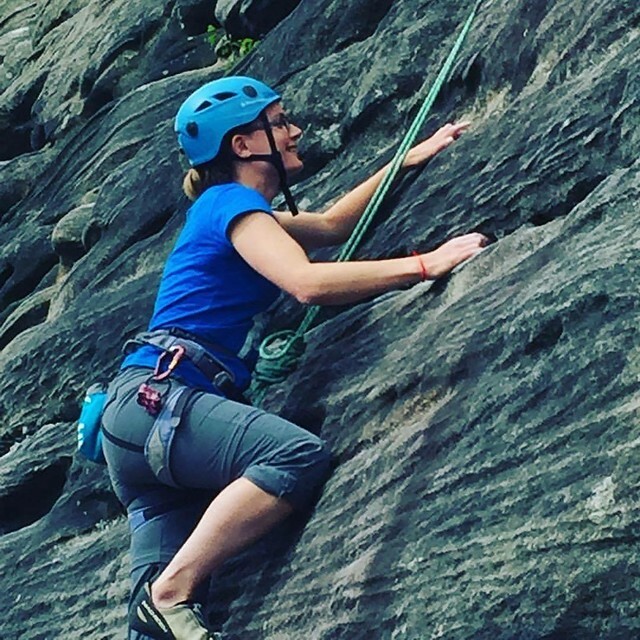 I didn’t think back in January when climbing outdoors made it on to my year’s ‘to try’ list, that I would become addicted to it. 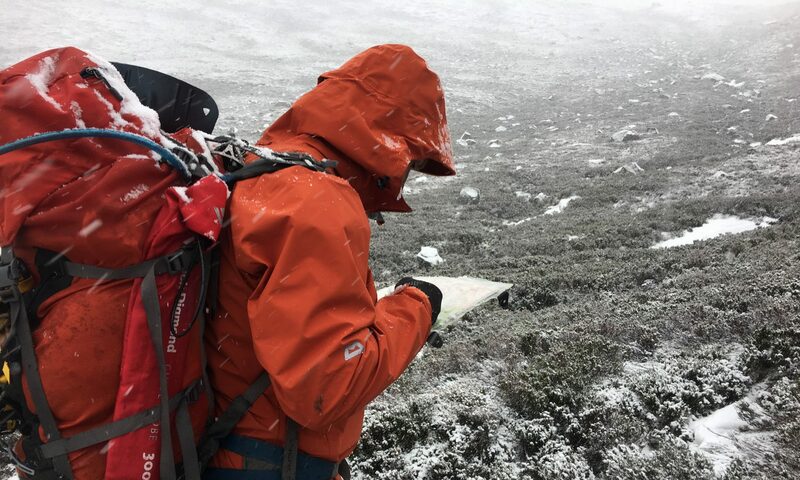 So much so that it seems to have replaced hillwalking as this year’s outdoor activity – I’ve had only 2 days trudging over mountains since the end of the winter season (2?!) and 16 so far out trad climbing. This might have something to do with the ever decreasing list of hills left to bag, and most of these being boring slogs over moors to featureless tops. It might also have something to do with a whole world of route lists on crags suddenly open to me – the tick list addict. When I started trad climbing at the start of the season, it was to build my confidence and skills on more exposed routes, so that the big mountain routes of the world are more achievable, and Project Tink isn’t just a dream. Little did I know that I would actually grow to love climbing just for the sake of it, and love spending the day climbing up various routes on short crags. I also didn’t think I would end up leading routes this year either. I’m not going to pretend moving into trad lead climbing has been easy. Without friends willing to show me how to place gear and give me the confidence to have a go I’m not sure I would have ever tried. Trad climbing is a strange esoteric activity and the grades of routes are completely incomparable to indoor climbing grades. 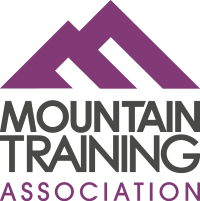 Trad climbing is hard to learn unless you pay a lot of money for a course at a mountaineering centre, or have friends patient enough to show you and crucially friends you trust. 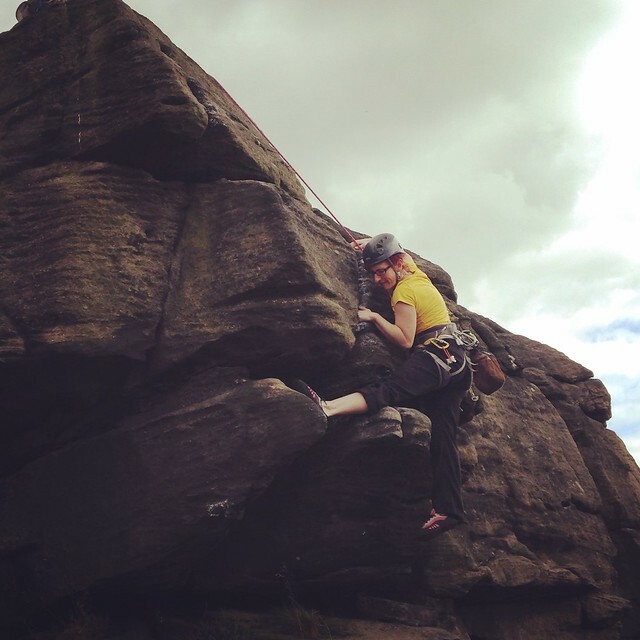 I’ve learnt loads from climbing with Emily Pitts from Womenclimb this summer, most of all I’ve gained a massive amount of confidence, both in my climbing and my ability to laugh at myself when I dangle instead! 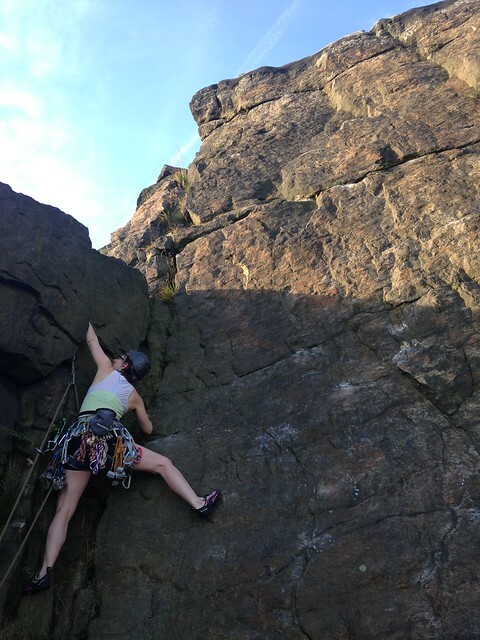 Here’s Emily climbing a route at Birchen’s Edge. 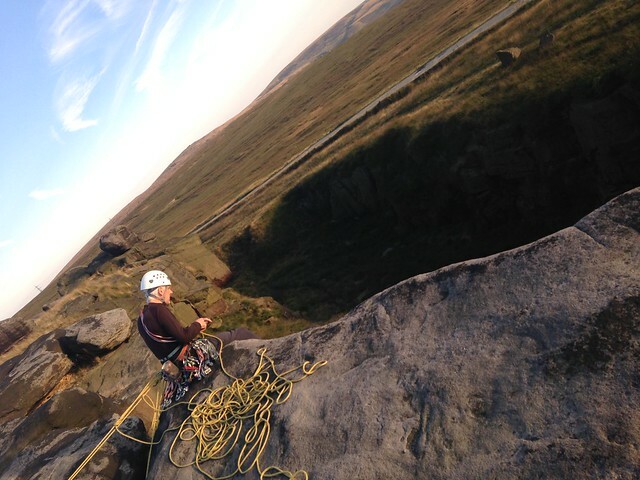 Here’s a great shot Emily took of me climbing Trafalgar Wall (Severe 4b) at Birchen’s Edge. Here’s Emily leading her first route after knee surgery, hence why its only an easy Diff called Cornette at Cow’s Mouth Quarry. This was the first route this year that I looked at and thought I could have lead it, as it was only 10m high and an easy break about half way. The clouds of midges put me off though! Here’s Dave belaying Seazy, Seasier and Sard. Dave is great to climb with as he climbs for fun not ego so the routes are never too knee-trembling-ly hard. 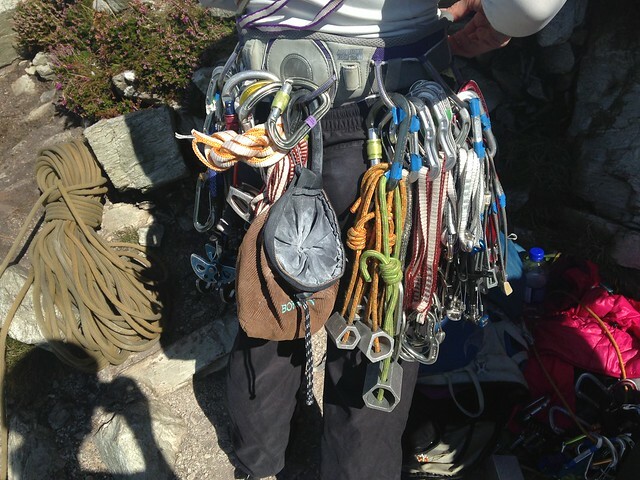 My first lead was Summer bank holiday weekend with the Karabiner Mountaineering Club on Holyhead mountain in Wales. 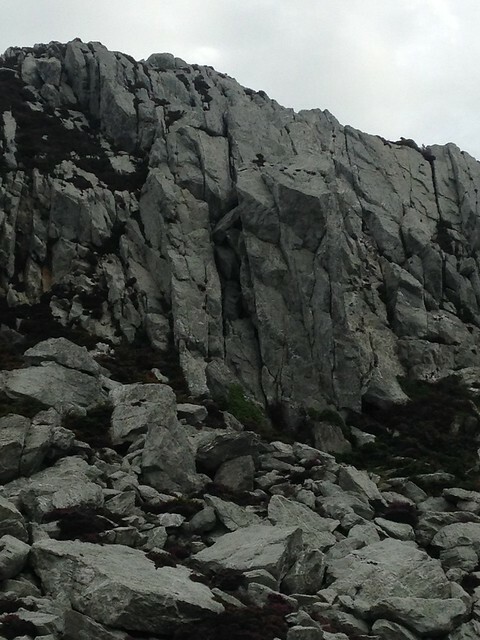 The route was called Plimsole graded Hard Difficult (HD) in UK trad climbing grades, so supposedly easy. I’d like to pretend that after a morning of climbing much harder routes and having loads of type 2 fun (the kind where you get scared but its still fun), that I enjoyed the experience of leading my first route. But does that ever really happen? Even the gungho guys I know probably didn’t enjoy their first experience leading trad, though I don’t think they’d admit it. Plimsole well and truly destroyed me mentally. 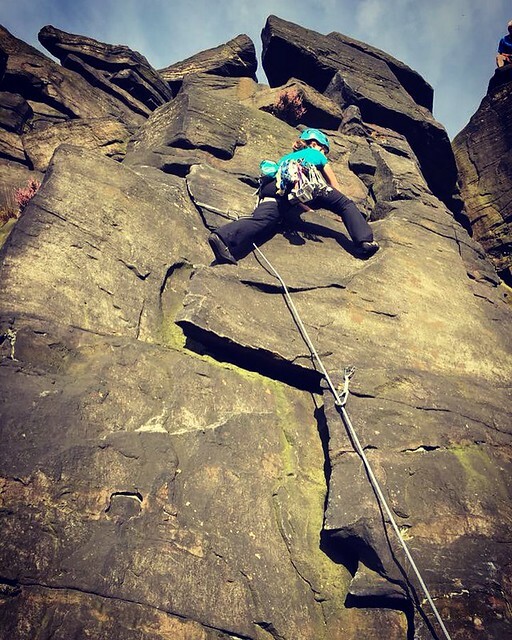 I don’t think it matters how well you climb, having to overcome the fear of falling and having confidence in your new skills of placing gear is much more of a mind game than seconding a route. I’ve managed to haul myself up routes as a second this year that I would never be able to lead. From the bottom Plimsole looked like an easy scramble up a gully of large boulders. Half way up I found myself trembling on the top of a boulder, trying to place a nut that I was confident would hold me at the same time uncontrollably sobbing through fear. Its the mind game I hadn’t mastered. I found myself lacking the confidence to step onto a block with no footholds and the handholds a long stretch away. Of course I managed it eventually and got myself to the top of the pitch where I had to pull myself together to sort out the belay anchors and bring up my two seconds, Emily and Dave. After the ordeal of the first pitch I was proud of myself for still wanting to lead the second pitch, despite both Emily and Dave saying some of my nut placements weren’t ideal. Luckily the second pitch was loads easier and shorter. On reflection it wasn’t really the technical skills I had issues with; most of the anchors where easy to sort out it, and I understood climbing on twin ropes. My issues were the fear of falling. Somewhere in the back of my mind that January winter accident 6 years ago in Scotland has tainted all of my adventures. After crying so much on Plimsole I really didn’t think I’d lead a route again for a long time, but just like Scottish winters after my accident, its best to have another go quickly or risk never doing it again. 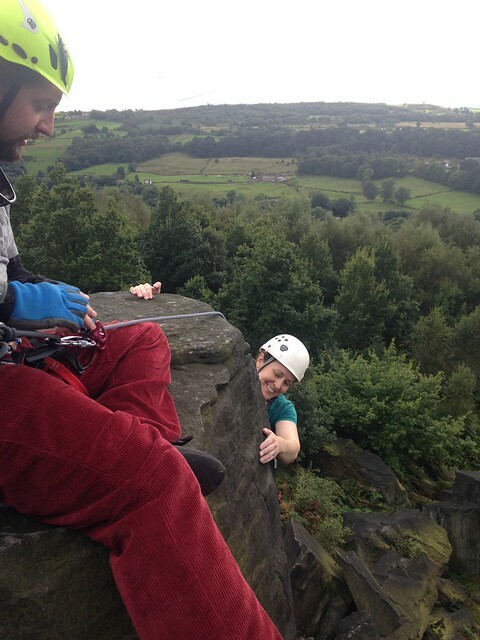 So, one Sunday afternoon with a group of friends we headed to Wharncliffe crags near Sheffield. We climbed 3 routes of varying difficulties – with me finding the traverse on Hamlet’s Climb graded HVD, way harder than Remus graded Severe. Here’s Jess and Owen on Cheese Cut Crack (a VDiff route). I’ve learned a lot from these two since they first took me outdoors in Wales, and out of everyone I know they are two people I would trust to take me anywhere. I hadn’t planned to try to lead another route that day as I was happy just being out climbing with friends. But I managed to lead Alpha Crack – only a Diff, which is the easiest climbing grade – but I don’t care about that. It was important for me to give it a go and get over my fear and manage the route without freezing. Stumbled across you blog by the underused South Pennines tag. Your honesty makes it such a compelling read, it’s like not being able to wait for the next chapter of a book. I have to ask… what happened in Scotland 6 years ago? Thanks that’s so nice of you to say. I badly twisted my left knee in a fall in The Cairngorms. I failed to stamp my crampon into old and very polished ice and when I stumbled I failed to ice axe arrest. I subsequently slid down the mountain on very consolidated snow. I also lost skin on my finger tips as I lost my gloves. It was only my second winter trip so very nearly put me off completely but I made myself go to Scotland again the year after. My knee hasn’t been right since though! I think the experience has given me a heightened sense of fear about falling and of exposure. Oh wow, that sounds so scary. Well done for getting back at it so quickly though! Fabulous post. I have also been learning trad this summer. You capture it well!